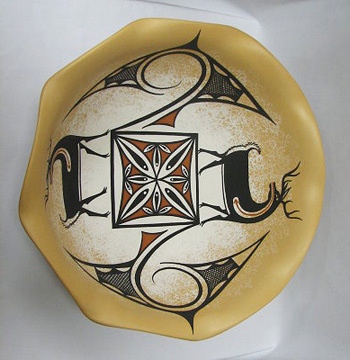 This is a beautifully shaped bowl made by Deldrick Cellicion of the Zuni pueblo. 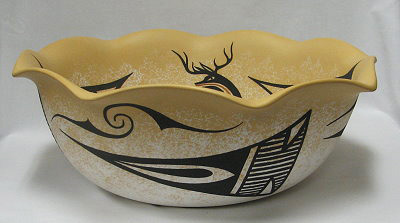 The inside surface of the pot is decorated with two heart line deer painted in Deldrick's inimitable style, along with geometric designs. Note the fading tones, the well-known painting style of Deldrick's work. This is a large vase measuring 14 1/2 inches in diameter by 5 inches high. It is in mint condition with no scratches, cracks, or other defects, and is signed by Deldrick. 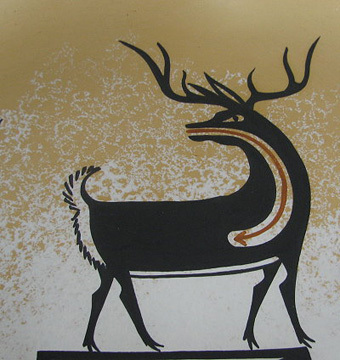 Deldrick Cellicion produces distinctive Zuni pottery in the forms of jars, bowls, effigy pottery and wedding vases. 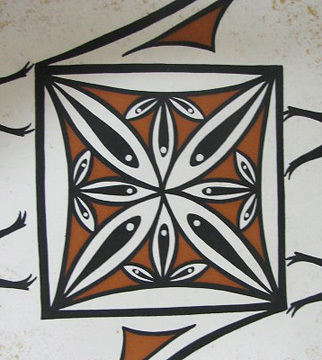 His designs include lizards, salamanders, frogs, rosettes, feathers and scrolls.